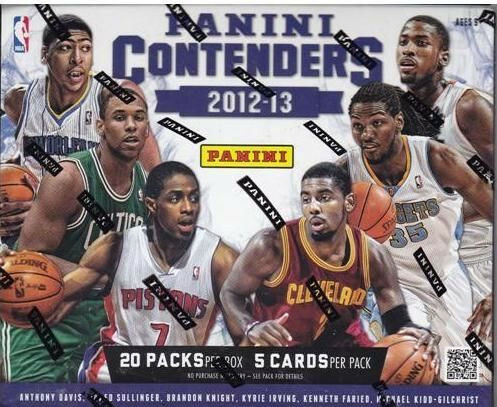 Factory Sealed Panini Contenders Basketball Hobby Box mit 20 Packs a 5 Cards per Pack. 4 Autogramme per Box davon 3 Rookie Autogramme. Produktinformationen "2012/13 Panini Contenders Basketball Hobby Box"
Find Rookie Autographs from both the 2011 and 2012 Rookie Classes!! After two years away, the collecting juggernaut returns with a completely new design, a massive Double Rookie Class. Find Rookie autographs, autographs from both current players and retired legends, four short-printed insert sets! Look for Substantial Prime Signatures, designed with an oversized jersey swatch! Extremely short-printed inserts provide a unique chase element! CONTEMPORARY CONTENDERS: The game's most electric players who promise to contend for the championship every year! SUBSTANTIAL SIGNATURES: This is the Contenders answer to Panini Preferred Silhouettes! Look for huge jersey patch swatches and player autographs! AUTOGRAPHED ROOKIES: Autographs from both the 2011 and 2012 NBA Draft Classes! HISTORIC CONTENDERS: Look for autographs of some of the game's most historic and recognizable players! CONTENDERS MATERIALS: Oversized memorabilia swatches from your favorite NBA Stars. Look for the short-printed Prime chase version! HOF CONTENDERS: Future Hall of Famers are showcased in this unique insert! Weiterführende Links zu "2012/13 Panini Contenders Basketball Hobby Box"
Fanbewertungen für "2012/13 Panini Contenders Basketball Hobby Box"